Many thanks to the readers of Prog Magazine for voting Now We Have Power into 6th place in the poll for the Best Album of 2018!! We were really thrilled! Thanks also to the writers who voted for NWHP the previous month which saw us just narrowly miss out on a place in the overall Top 20. Prog Magazine Readers' Poll - Vote Now! Thanks to everyone who has bought a physical or download copy, or otherwise streamed and enjoyed Now We Have Power! We’re thrilled with the reaction so far. 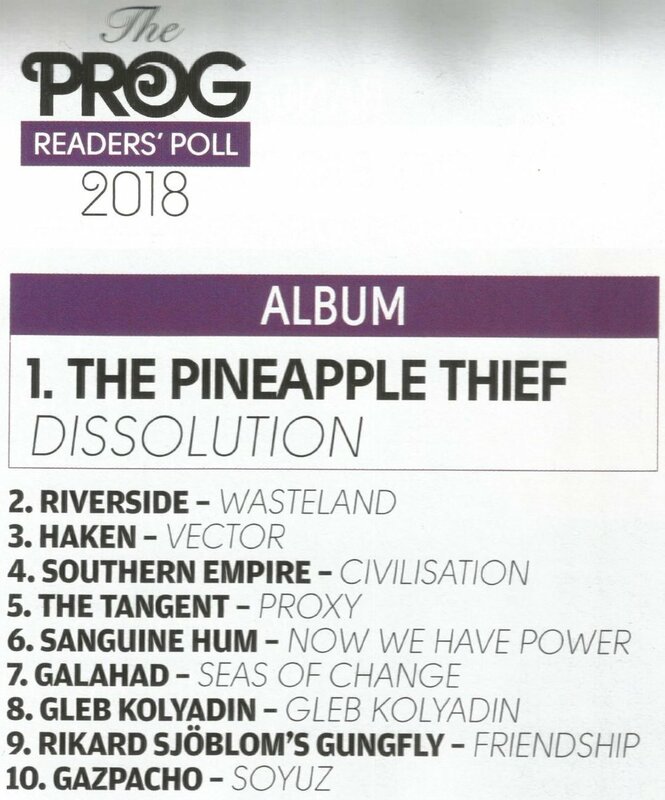 If you’d like to help the album get noticed by even more people then it would be great if you could spare a few moments to vote for us in the Prog Magazine Readers’ Poll … thanks! Now We Have Power was listed in John Kelman’s Best of 2018 list at All About Jazz, whilst also making the Top 50 list at Altprogcore. Plus making it into four of the Prog Magazine Writers Top 20 Best of lists in the current edition which is really nice to see. For those that may have missed it we made three short documentary films to promote Now We Have Power with each one taking a look at a different session during the making of the album. They are gathered together below. That’s it for 2018…happy new year from all of us! We're really pleased to announce that our next album, Now We Have Power, will be released by Bad Elephant Music on October 12th, 2018! The long-awaited sequel to 2015's Now We Have Light sees original Sanguine Hum drummer Paul Mallyon return as a guest musician and also features guest trumpeter Mark Kesel, plus a special guest vocal performance from Canadian multi-instrumentalist and composer Kimara Sajn. The 14 track, 62 minute album will once again come wrapped in a sleeve designed by Meriel Waissman. Welcome to the brand new Sanguine Hum website, which is in fact technically the first ever site dedicated to the band. It replaces our old Troopers For Sound label headquarters and will be the primary source of information for all Sanguine Hum activities, as well as our related projects Antique Seeking Nuns, Nunbient and all solo projects. In the coming weeks we'll be opening a new store for which we are currently sorting through stock of the final copies of all of our Troopers For Sound releases...including a VERY limited supply of the debut Nuns EP Mild Profundities that we recently unearthed in the archive. Stay tuned for more news on that. Elsewhere you'll find pages dedicated to every release, with links to stream or purchase and for the first time ever: complete lyrics! There is an extensive media section that we'll be adding to on a regular basis, including a photo archive, interviews, videos and more. Finally, if you have a burning Hum related question then head to the Q and A page and we'll do our best to publish a response. We hope you enjoy digging through our history and maybe discovering some new aspects of our work to keep you entertained whilst we move ever closer to finishing the big one...Now We Have Power!